We love helping families volunteer together! To do this, you'll need to register using the team functionality. This feature is for families living in the same household. 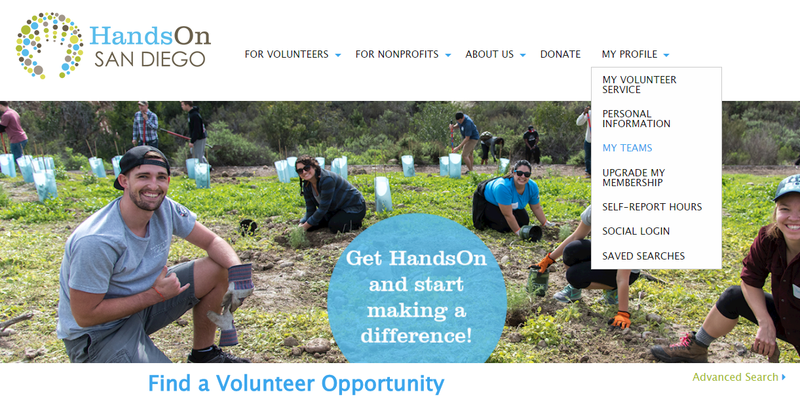 To sign up for any projects on our site, one family member (over the age of 18) must first be registered with HandsOn San Diego and activate your account by donating $50 for a family account. Click Register to create an account or Login at the top right of the page if you already have an account. After you've completed the registration process and activated your account, go to the My Profile tab and click My Teams. From there, click on the Create New Team button. Enter your Family Team Name (It MUST CONTAIN the word "Family"), description, privacy, affiliation (if applicable), and your family's names, email addresses (if they have one), phone numbers and ages. By creating a team, you are automatically a member of that team. Please note that if you are adding children to your team that are under the age of 13, you must use a parent or guardian's phone number and email address for their contact information. Under the Children's Online Privacy Protection Act we are unable to create unique accounts with email addresses for children under the age of 13. It's best to include an email address for all family members over the age of 13 (if they have one) so that they can verify their team membership, and create their own individual account within our system so that they can receive confirmation emails, reminders from the system, and have their hours tallied. If a member of your family does not have an email (or they are under 13) then it is your responsibility for getting the project information to them as they will not receive any communication from HandsOn San Diego. Assign a member of your family as the team captain - the member who will oversee the team's coordination and participation. It is best not to have more than two captains. Captains cannot register people on their team for a project without also registering themselves. Use our search feature or browse our Opportunity Calendar to find a project that has the appropriate number of spaces and age requirements available for your team. You can sign up some OR all members of your team for each project you are interested in. Sign Up As a Team: Usually this is a HandsOn managed project or a special event (unless otherwise noted in the description). After clicking, the next page will let you choose which members you want to sign up. Each member will be automatically signed up for that project and those you put email addresses in for will receive a confirmation e-mail containing all of the information you will need. Be sure to only sign up members of your team who have said they will attend the project. Express Interest As a Team: This is a referral project, thus the community organization is managing this project directly or it is an ongoing need. After clicking, the next page will let you choose which members you want to bring. Once you submit, this will notify the agency contact of your team's interest and they will contact you to schedule you to serve. Every person who plans to attend the project, including YOUTH, must be signed up for the project.